Split decision. I have the Martinas in gold and I’ve worn them 2-3x. I love the comfort and can do a full day in them. They’re very metallic gold, no doubt about it. I haven’t seen the Banana Republic option, but they look more subtle in color. If I were ordering them, I’d take the larger of my 2 sizes, 8. 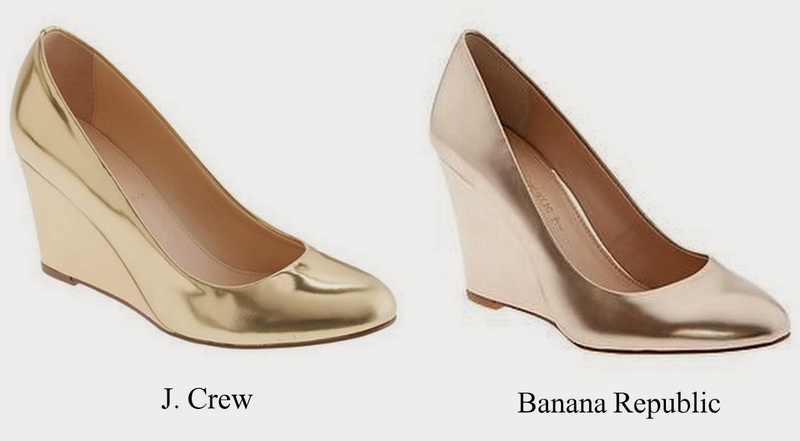 J Crew Martina metallic wedges – These are still available in metallic blush. I haven’t seen this color irl. The regular gold is enough for me. These Lilly Pulitzer wedges look so cool. I wouldn’t expect to like the mash-up of textures, but I do. Take 30% off full-priced items with BRDRESSED thru 11/22. There are some exclusions, including BR Picks. The Maisie is a BR pick, but the gold color is not flagged as a Pick. The promo code should work on it. I just bought the BR ones and they are a total thumbs up! I was looking for something a little more muted so this worked for me. As for comfort, I wore them from 8 am – Midnight and it didn't bother me at all. Good to know. Thanks for sharing, Alice. I will have to try on BR shoes again. I haven't in about a year. They always have cute styles. Most of what you say is supprisingly accurate and that makes me wonder why I hadn’t looked at this in this light before. This piece really did switch the light on for me as far as this subject goes. But there is actually one particular point I am not really too comfy with so while I make an effort to reconcile that with the actual core theme of your issue, allow me observe just what the rest of your subscribers have to say.Very well done. and on the web I found this web site as a most excellent website for hottest updates.